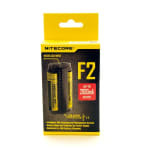 The F2 by Nitecore is a rugged portable dual bay Li-ion / IMR battery charger with powerbank support delivering 2A and two USB output ports. 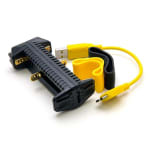 Compatible with 26650, 18650, 17670, 18490, 17500, 17335, 16340(RCR123), 14500, & 10440 cells. 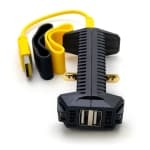 The F2 by Nitecore is a portable dual bay Li-ion / IMR battery charger with powerbank support and two USB output ports delivering 2A. Made from durable, lightweight polycarbonate and only 46.5g, the F2 is ideal for all types of use including outdoors! Compatible with 26650, 18650, 17670, 18490, 17500, 17335, 16340(RCR123), 14500, & 10440 cells. The F2 uses a regulation control circuit to automatically select the best charging mode. With adequate power input, the F2 will simultaneously charge both the batteries and connected devices. Otherwise, 500mA is dedicated to charging batteries and remaining power is diverted to connected devices.